I’m not going to lie, folks, I have kind of closed us into a bubble, of sorts, upon returning to Panhandle. I was not only desperately disappointed and frustrated at how we were treated in Fort Worth, but I was also dealing with some relationship issues with my Cable Guy, feelings of complete loss and grief over my mom, and just all over depression. I have struggled, since last week, with the feelings that Mom got me to Cooks and then left me. I know, I know.. she is right here with me, but I was so SURE that Cooks was where she was pointing me.. But once we got there I never once felt her presence, I never felt that tingle of a eureka moment, like I did in Dr. Hashams office.. she was not there… And it made me feel even more alone. As the days have gone on though, I realize how much support I really do have… in all of you. I realize I am not alone, that I have created this island of loneliness and desolation in my own mind.. that all I have to do is reach out and there is always going to be someone there to listen, support, encourage and love me. Thank you all for that! So, we are back to square one, so to say. I need to start with how I am processing all the info I did get while at Cooks, and what I have decided to take away from that whole experience. YES, I am VERY HAPPY that Owen does NOT have a visible brain tumor, cancer, lesion or anything else going on in his brain. That could have been a devastating and deadly discovery! I am so thankful that he is not suffering from something deadly and terminal! I never thought he was, but it’s always a relief when you hear the words “We see nothing”. No matter how devastated I was by them not seeing a lesion on his Hypothalamus… I was, at the same time, so happy my son does NOT have a brain tumor. I do not doubt that Owen is having some types of seizures. I have seen them several times upon our return. I do not doubt that there is really something wrong with my son. Do I still think it is a Hypothalamic Hamartoma? I am not sure. All I can do now is keep gathering my info, gather his records, rigorously film Owen’s daily activities , document, research and eventually this will lead to finding the right doctor with the answers. Owen and I did a LOT of talking on our trip, especially on our way home. I will be restricting his computer and Xbox time even more, we will have an activity jar of things for us to do together each day, I will spend even more time with him one on one, and he will start going walking with me. We have a goal of starting hiking together next fall. We want to be able to get to the mountains and backpack, together. So before we can hike in New Mexico… we need to be able to walk in Texas without getting tired on the first mile. I think the fresh air and goals will do us both some good as we keep trying to figure out what really is wrong with him. I am sure you guessed, just by the title of this post, I am NOT a happy Momma. Dr. Ryals’s nurse called me around 9:00 this morning. She had a list of Psychiatrists that Doctor Ryals would like us to choose from for a Psychiatric evaluation. Before she gave me a phone number for the first one, though, she took it upon herself to question me as to why I didn’t want a child psychologist in our own area. “I am sure there are capable doctors in Amarillo that can help Owen with these emotional outbursts?” she stated. I explained, once again, about why we are here in Fort Worth, why we needed to get too Cooks and about the rages being only one of a grocery list of symptoms that are plaguing my child. After all of this, I quickly realized she only heard one word, of what I said…. Suicidal. I explained to her about the rages and all the other symptoms going hand in hand with the Hypothalamic Hamartoma… how he has other symptoms that Dr. Ryals didn’t even care to hear about. About how the Hamartoma can be as small as a thread and not able to been seen every time with the naked eye and I am not convinced that Owen does not have this. She didn’t even know what a Hamartoma is.. she was very condescending and dismissive at this possibility. Shocked, I gasped “Normal? I thought it was supposed to take 2-3 weeks for results to come back because they had to view the EEG very, very critically and watch the video?” (This is what the LVN that called yesterday had told me). The nurse kinda stammered a minute and said “weeellll, they do…. but there were no big episodes seen during the initial first review, and we don’t usually have specialists come in for minor to miniscule episodes if the child is on Medicaide”. That’s when the door in my brain slammed shut. stuttering and unable to say a sentence without stammering and getting distracted… this used to never happen! rages, unprovoked and sometimes not able to remember them. She asked me to elaborate most of these. it was a very in-depth process. I felt like someone was finally hearing me.. I felt better as we talked. She wrote them all down, and then told me she would go talk to the doctor and call me right back. 30 minutes later… she called. I am not sure what exactly happened, but she came back on the phone a completely different person. Closed off and cold, very detached and stated simply..
“For the thirst, loss in appetite fatigue, and night sweats you need to have your pediatrician refer you to an endocrinologist. For all the other stuff you really need to get him to a child psychologist. Make sure he is getting plenty of rest and water, this will help out with constipation. Give him a multivitamin and make sure you feed him a healthy diet. Dr. Ryals can not stress enough that this child needs to be admitted to an in-patient psychiatric facility for observation and meds to manage Owens attention problems and emotional outbursts. But when she said this last sentence, I was furious!!! I curtly said, “I’ll try to” and hung up. My mind is still reeling from the conversation and the feelings of shock and frustration.. and it’s been over 8 hours now. I feel completely defeated and like this entire trip was a waste of time, money and emotional strength. Where do I turn now? What do I do? I can’t go down without a fight! I am NOT going to take these results as the final word and just slink away in shame. I can’t! I have to fight! For Owen! I am going to figure out what is wrong with my son! I am going to figure out why my son is perfectly fine sometimes, and completely out of his mind, in pain, exhausted or ill most other times. I have a plan… I think. It may change when I have an entire night to lay in bed and think about the days events, but for now… this is my plan. I am going to go back home. I am going to make an appointment with Dr. Hasham and tell her about this awful experience. I am going to request Owens records from Cooks, and I am going to start video taping his every move. I will take him to see a psychiatrist, I will take him to an endocrinologist, I will even take him to a different pediatric neurologist. I will not, however… GIVE UP. I will save all these videos, test results, doctors notes and I will send them all to Barrow Neurological Institute. If and WHEN THEY tell me that he does not have this HH… then I will belive it! Something is wrong with my son! If I don’t do something soon, I could lose parts of him that make him able to function as an adult. Able to live a full life. “Mom, I have decided something … I think if they don’t know whats wrong with me, if I never get fixed, I think it’s best if I stay single… that I don’t ever have a girlfriend or a wife. I think I should move into a small house out back and live completely alone… that way, when I have a rage as an adult, I can’t hurt you, LaLa, my wife or kids… I can’t hurt anyone I love… if I am never around them. Kinda puts it all in perspective doesn’t it? Kinda makes you understand why I’ve gotta fight. I have been in my “hidey hole” for about 24 hours now, just trying to process and rethink the events, information and emotions of the past 2-3 days. 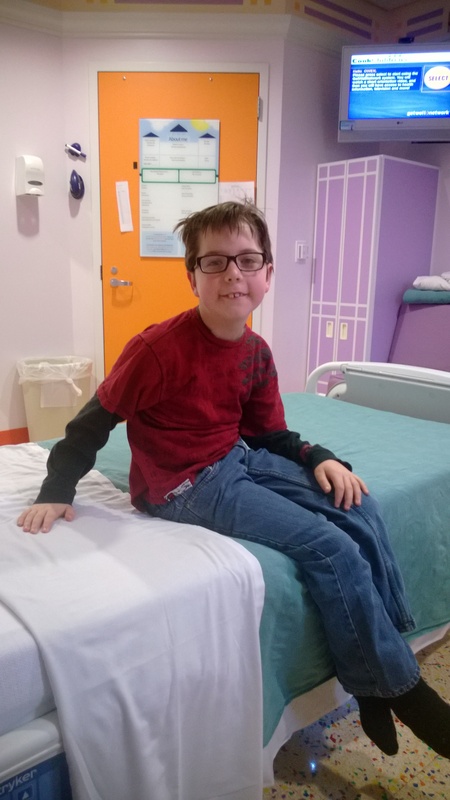 After the traumatic and unsedated MRI, and after the VERY stinky, very aggravating EEG hook-up, Owen was able to go back to our room and rest, and rest he did! He slept for 3 hours. He slept the deepest sleep of his life! I know you mommys out there know what I mean by saying, “He was the Gerber baby” for the next 14 hours! NOT really what we needed from him. I did everything within my power, over the course of the night, to provoke a rage, an absence seizure… anything I could. I woke him up abruptly and noisily. I beat him at Dr. Who Monopoly, I put him on the computer for hours with the brightest, loudest, most obnoxious You Tube videos he watches. I forced him to recite multiplication facts, I gave him hot chocolate and cookies…. I did it all! The closest we came to a rage was when the girl’s voice came over the room speaker to tell him to leave his leads alone, they itched terribly and Owen was constantly picking and pulling at them. He got pretty mad at her by the 4th time, but still no rage. I finally gave up and let him sleep from 4am untill around 7am. I maybe slept 45 min. By the time Dr. McLoughlin (the neurologist on call) came in about 12:30, I was exhausted and completely in a state of aggravation at what all had happened with Dr. Ryals the day before. I was prepared to voice my frustration to this sweet little older man and receive some… empathy? understanding? Well, what I got was a quick answer and a sense he had no time to talk. I was shocked!! Is THAT what they thought?!!? “well”, he said “maybe they will see something on the EEG, but for now that’s all I can tell you”. I sat down at the table and numbly stared out the window for a while. Then I went next door to the lounge and called my dad. I returned about 10 minutes later, ordered Owen some lunch and sat down on the couch to look at Facebook. That’s when I noticed Owen pulling at his leads again. I told him to stop and when he looked up at me.. I saw the “look”, that look he gets right before a rage. So I egged him on, “stop it Owen, leave those alone, honey!” That is all it took… He was off and running! Trying to leave the room, screaming, crying, trying to lock himself in the bathroom….. RAGING!! We finally got a rage on the video and on an EEG monitor. I pushed the button and they were marking it in the EEG room. It took 4 nurses and me to hold him down and about 25 minutes of screaming, kicking and hitting, but he finally came down enough to want to cling to me and hide from everyone else. It was BEAUTIFUL! I was so glad he did that! Proof!! Now, if it is a seizure, then it should show up on the EEG. if it is not… then we are back to square one completely. 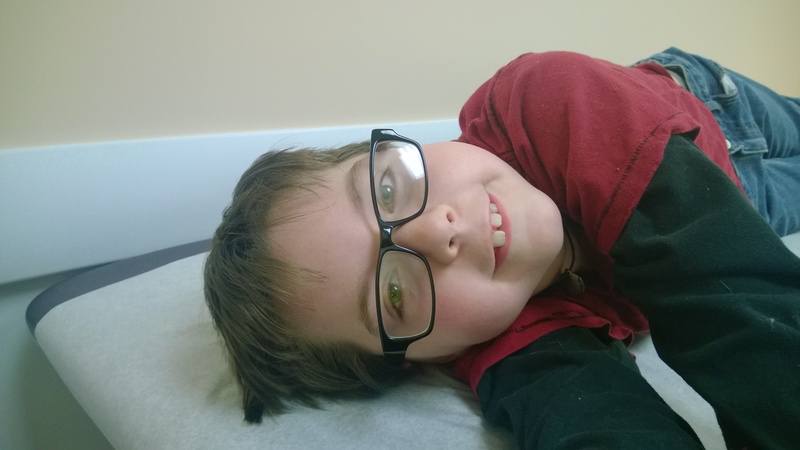 Dr. Ryals had stated in his office that there are Doctors called Neuropsycologist, that might can help Owen if we can’t figure out anything from these tests. Which means, Owen could live a life of psychotropic drugs and being in the mental health system. So I am going to stop Googling for the time being, and hope we get some results soon. Am I convinced it’s not a Hypothalmic Harmatoma? Not particularly, I am still trying to decide if I forward these records on to the Barrow Neurological Institute in Phoenix. Am I relived it’s not a Hypothalamic Harmatoma? Yes! I am confused, exhausted, deflated, depressed, elated… and most of all…. very worried about where to go from here. I hope the doctor calls today, or we have to head back home tomorrow. As I write this, I am sitting in a brightly decorated room on the 4th floor of Cook Children’s Hospital… We made it.Yesterday was a whirlwind of meeting the doctor, more on that in a bit; blood draws, an MRI (that lasted entirely too long for a small, claustrophobic boy to not be sedated), and finally the hook ups for the 24 hour video EEG. When we left my sister’s house, yesterday morning, we had NO idea that we would be here the next morning… but here we are. He did note that Owen seems “distracted”, and there is visibly something wrong with his processing and his attention. He felt like it is not seizures though, rather an underlying neurological disorder that most likely can be “tweaked” by a child psychologist with the right meds…. Then he asked me if anyone else in our family has a history of seizures. I mentioned my mom ultimately passing due to what we initially thought was strokes that turned out to be brain seizures. Well, he dismissed this also! With no emotion or candor he said “Well, you know once those Lymphoma people get it in their brain or heart.. they are just GONNERS! !” Well obviously! But he dismissed my moms seizures as well as my sons!! By the time I realized what he actually said, that my moms Lymphoma had most likely spread to her brain and that is what had started the seizures and heart attack and everything that would eventually take her from us… he had already mumbled something about, “gotta go get this all started”…. and left the room. No “be right back”, “see ya”, Nothing. We sat there another 15 minutes waiting before the nurse found us, surprised we were still there, she scurried back down the hall to find out what was going on. Then a little transporter came around the corner to take us to admitting! No one knew what tests he was ordering, I had none of our stuff with us, my car is still sitting in valet parking. Crazy! Through the course of the afternoon I discovered they are testing his thyroid, doing blood work, an MRI, a 24 hour video EEG, checking for diabetes, kidneys, heart rhythm, and some other things. Not a mention on anything about his Hypothalmus. I have spoken in depth with both the first nurse we had yesterday and the nice, male, nurse last night. They both feel I should tell the whole story to the neurologist on call today. The night nurse told me not to leave here without answers and feeling like I am being heard. That was my right as the mother. So thats what I will be working on today. I am anxious to hear any results. I just have to keep in mind that I don’t have to “settle” for just these results and go home with our tails between our legs. Please keep praying that we get some answers. Pray that the next doctor or Nurse Practitioner hears my concerns and something is done for my poor, sweet, boy! Patience is not just wearing thin… it is GONE! LOL Poor baby! Just as I suspected!!! His case had been “closed out” at the Amarillo office due to the normal reading on his EEG. I TOLD the doctor that I was afraid that it wouldn’t show up and explained the absence/ gelastic/ dycrasystic seizure thing to her and asked if we could please get an MRI also… but instead of doing that, they closed him out! So calling Cooks Children’s in Fort Worth, myself, this morning turned out to be very, very beneficial! I know I never discuss it, but money will be an issue, gas, food, etc… I am pretty concerned, but seeing as Mom has gotten us this far, I am trying to trust something will work out in this area as well. Next up, for all you wonderful praying people that are following this adventure of ours.. is please, please, PLEASE, be praying for Dr. RYALS Pray he will see, hear, and help us. Please pray for his wisdom, kindness and guidance. Pray that he has an open dialoged with us and hears the things he needs to hear to help diagnose my boy. Pray that he has a good day Friday, is feeling good, and is ready for this dynamic case we will be presenting!